On Saturday, my wonderfully talented friend Nancy came over to my house to teach me to sew zippers. Sounds simple enough, but anybody who sews can tell you that it’s not the easiest thing to learn. There was a lot of thinking and problem solving going on – I felt like I was in a math class. And we were doing word problems. 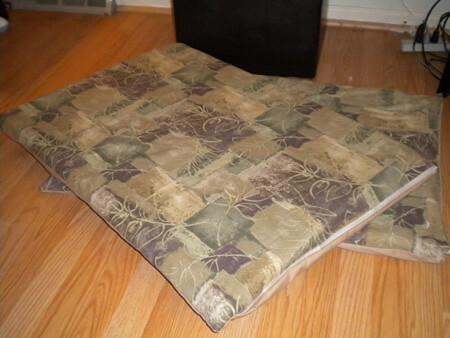 About five hours after starting the zipper process, I had two somewhat nicely made dog bed covers. Today I headed over to Foam & Fabric after work. I asked them about memory foam, which I learned would be $80 for a sheet. I then changed my mind to the two-inch foam they carried. I got out of there after spending $28.02. 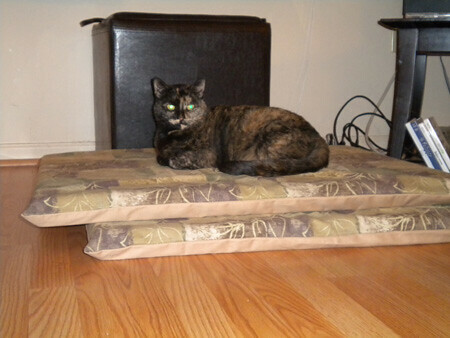 Not too bad (and they did the hard work – cutting the foam to fit my covers.) I actually thought that the foam would be somewhat small and I could fill the sides with fiber fill, but when I put the foam in the covers, they fit nicely. The beds are approximately 26 inches wide and 36 inches long. They’re two inches thick. The foam is about 23 inches wide and 33 inches long. The covers didn’t go on smoothly (I really had to shove the foam into the cover) so I probably don’t need the extra stuffing. I’m REALLY happy with how they turned out! I still need to hand sew two corners on one of the beds where I managed to mess the zipper up a bit, but you can’t even tell that there’s a problem. Best part is, my husband thinks they’re cool and I think the dogs are going to really like them! They’re big, but light, and can be moved to whichever room we’re in so the dogs can be near us. And since I didn’t spend money on the fabric (it was scrap fabric my mom had), I really only spent $4 on the zippers, $28 on the foam and nothing else! You may be able to buy a bed cheaper than that in a store, but I’m pretty psyched about the handmade beds. They look great…good job! Picturing you fighting the foam…LOL! Those look great! I’ve NEVER been good with sewing on zippers…I always manage to get them turned around or offset so they don’t line up.